NATIONAL ASSOCIATION of LETTER CARRIERS 14TH ANNUAL FOOD DRIVE! 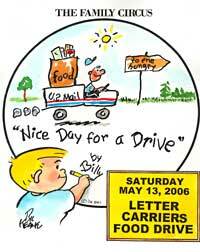 Letter carriers will be collecting non-perishable food items for their “Stamp Out Hunger” campaign. So get busy and clean out those pantrys and donate. You can put all donatioins out by your mailbox and your letter carrier will collect the items. All food items collected will stay within your community. Last year they collected over 71 million pounds. ← Tony, Kevin, Elliott…Oh My!